Nudging Grocery Shoppers Toward Healthy Food Some grocery stores are using the same sensory marketing tricks to change people's buying habits that big food companies and restaurants have used for years. These new marketing tools can also promote public health. Grocery stores are not necessarily designed to help customers choose the healthiest food. Signs and specials advertise chips and soda, and the coupons are usually for the pre-packaged, processed foods advertised by big brand-name companies with deep pockets. So how's a lowly banana going to compete for attention? Some stores are getting wise to shoppers' desires to eat better, as well as the challenges they face in doing so. Some are subtly shifting the focus to healthier products by using the same marketing tricks the large food companies and restaurants have used for years. The bonus for them is that they can sell more and waste less. Brian Wansink, the co-director of the Cornell Center for Behavioral Economics in Child Nutrition Programs, says grocery store sales goals are compatible with public health goals. "Grocery stores want you to buy healthy things. They want you to buy produce, because if produce goes bad, they lose money," he says. But just putting more produce and healthy food choices in the aisles is not going to cut it, he says. "Even when you give people these incredibly healthy stores, they're not buying escarole and tofu -- no, they're buying what they want. It's not escarole and tofu simply because it's in front of them," he says. 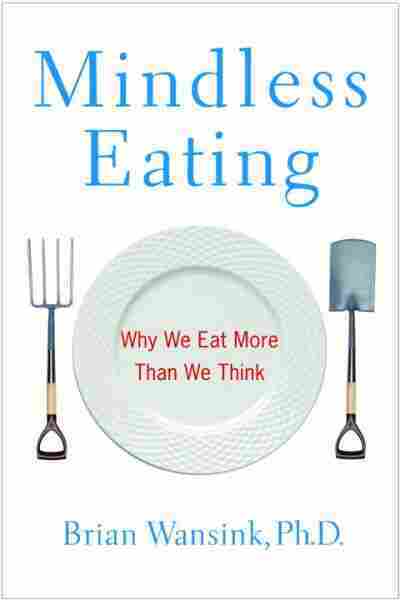 Wansink is also the author of Mindless Eating, a book about why we eat what we eat, and the subtle cues that make that happen. 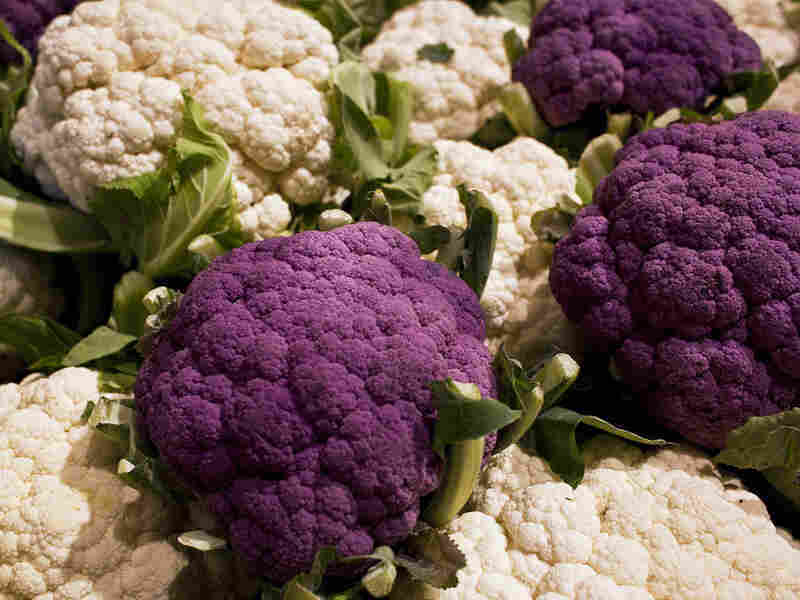 He's done a lot of research on produce and found that there are small things stores can do that will help them move a lot more volume of the healthy stuff. Take product placement and soft, focused lighting, for example. Items that are highlighted in this way -- even if they aren't on sale -- sell about 30 percent more, Wansink says. They just look more appealing than products under harsh, overhead fluorescent lights. One company that's taken some of this kind of advice to heart is Wegmans, a regional grocery store chain located primarily in the Mid-Atlantic region. Like many people, Terri Williams of Bladensburg, Md., struggles with eating better. She wants to incorporate more fruits and vegetables in her diet, for one thing. But it's a challenge, she says. Her daughters are grown and out of the house, and she doesn't cook much for herself. But when she walks into the brand new Wegmans in Lanham, Md., for the first time, she gets excited. The produce section is front and center. Williams' eyes light up when she spies some of her favorite vegetables, lit by a soft spotlight, and right by the entrance. "We're going to get some candy yams," she says excitedly, and starts piling several into her shopping cart and talking about how she'll roast them later. And that's exactly the kind of enthusiasm Krystal Register wants to hear. She's a registered dietician and a staff nutritionist at Wegmans. 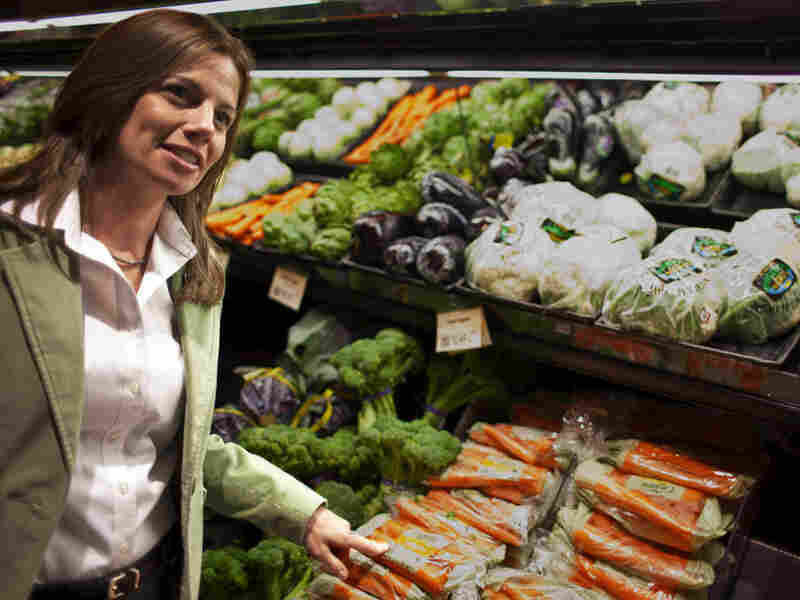 It's her job to help customers and employees make healthier food choices. "We actually have lightened the ceiling in this new store, and we're using some natural light with some high windows, and yes, we direct the lighting right on the product," she says. Register shows off the new store to a visitor: Near the produce, a trained vegetable adviser prepares some of the featured items for customers to taste. She hands out advice and recipes with a smile. "I love that the vegetables are right there, before you get to the processed food," says Gretchen Muir of Upper Marlboro, Md., who was shopping with her husband, Kenny, on a recent weekday. 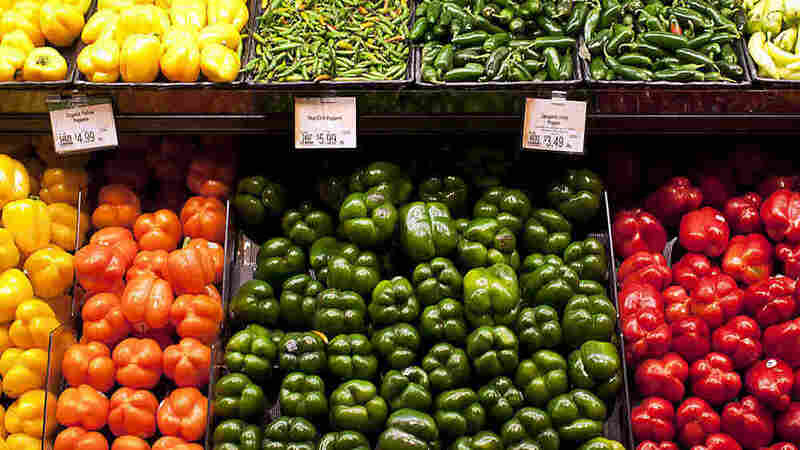 Grocery stores want you to buy healthy things. They want you to buy produce, because if produce goes bad, they lose money. Muir also thinks the store's varied offerings improve the neighborhood's food choices. "There's too much fast food in this area," she adds. Around the corner from produce, there's the smell of prepared foods being cooked and served. Smells can be used as an enticer, rather than just "fanning them out of the building," as many stores do, says David Glenn, a doctoral student at the University of Connecticut. Glenn spent 20 years in food marketing before returning to school and is working on ways to improve kids' diets using marketing like this. And then there's the Wegmans bakery, where rows of whole grain breads sit side by side with white bread -- they're not relegated to the back corner somewhere. The frozen pizza is placed right next to the frozen vegetables at the end of another aisle, and that's by design, says Register. "Our mission ... is to help our customers with good nutrition in the aisles, and on the plate," she says. Aside from lighting, it's important to put healthy products at eye level, Wansink says. "What you're doing is encouraging people to take stuff that's right in front of their eyes," he says. That way, they don't have to work, looking up and down. Also, take a hint from a good restaurant menu. Describe the foods you want to highlight a little, he says. For example, if you describe something as "succulent Italian seafood filet" rather than just "seafood filet," it will sell 27 percent more, according to Wansink's research for Mindless Eating. And then there's the concept of anchoring. That's when stores offer a deal on a set amount of items. It makes people buy more than they ordinarily would, because that limited-amount number sticks in their brains, he says. Wansink admits that even well-educated consumers fall for marketing. Shortly after he published research on anchoring, he found himself with a friend in the checkout aisle, where he saw a special on gum. He says he saw a sign advertising eight packs for $1, and started counting them out on the conveyor belt. His friend pointed out that he had just done studies on the topic, and, he says, he started putting the gum back. The danger with these marketing tools is in going overboard, bombarding people with public health messages about how they should eat better. If people feel persuaded, they will resist, Wansink says. Stores have got to make the shoppers feel like it's their choice. "It's like when you're at a stoplight and the light turns green and the person behind you honks all of a sudden, what do you do? You pull away a little slower," he says. These marketing methods may be a little bit trickier when you're a small mom-and-pop shop. But research shows that some simple changes can work. Romny Tejeda runs a small urban market in Hartford, Conn. When he first added fresh fruit and vegetables to the inventory of Romny Mini Mart a few years ago, he put them in the back of the store. He found that he was throwing away a lot of spoiled produce -- until he moved those items up front, by the door, just like the bigger stores do. "I used to probably sell a case of bananas every three days, now it's pretty much two a day -- two cases a day," he says. The same goes for the avocados, peppers and tomatoes he's recently added. In fact, he's expanding his fresh food offerings and is putting in a large new refrigerator case to keep the items fresh.